The questions How many triangles are in this picture? How many of them are the same? With some careful observation and counting, you can answer the first question. You can’t answer the second one, though. 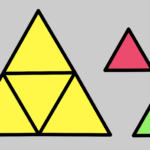 Not until you decide what you mean by “same.” Counting the triangles Show the picture of the triangles to a friend and count them together. That’s a good way to make … [Read more...] about What is the Same?